Friedensreich Hundertwasser (1928-2000) was an Austrian artist and architect who is best known for the colourful buildings he designed, built with attention to the environment and nature. The buildings of Hundertwasser are very recognizable: straight lines are missing, there is use of bright colours and many of his buildings have typical turrets. The influence of architect Gaudi is very obvious. The paintings of Hundertwasser have exuberant colours too and mainly undulating lines. Ask students what they think of by seeing those spirals. Probably they see real lollipops in them! Lollipop trees, that's what we're going to draw today! Demonstrate the drawing of a spiral, starting in the middle. Stamp the white sheet with sponge prints in colours you like and put the work out to dry. Trace on black paper round shapes in different sizes. 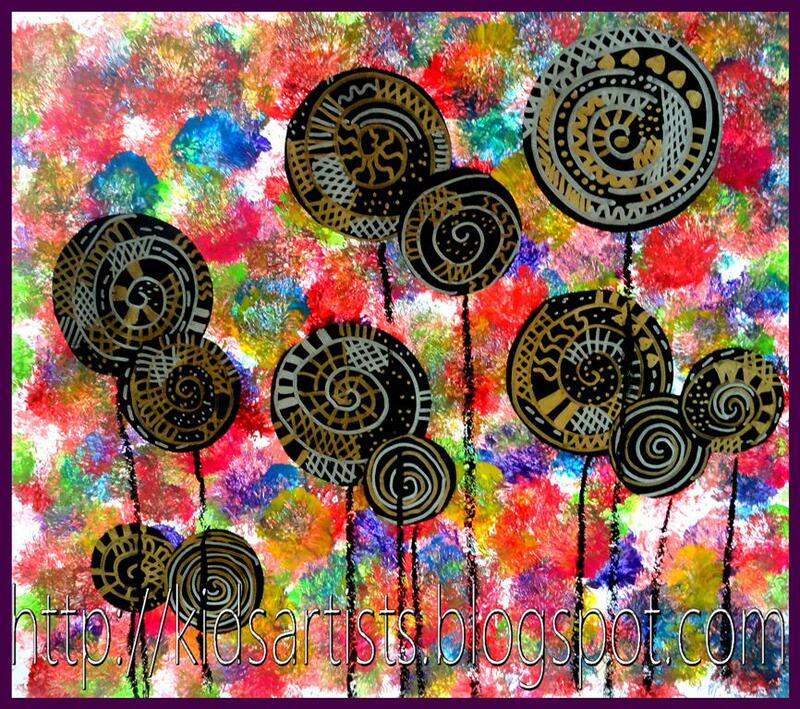 Draw spirals in them with gold or silver markers. Fill the space between the lines with patterns in gold or silver and cut the circles. Create a composition of lollipops on the stamped sheet and paste them. Pull lines from the lollipops to the bottom of the sheet with black oil pastel, the trunks. Draw the trunks through the circles if necessary (overlap), to show depth in the lollipop woods. 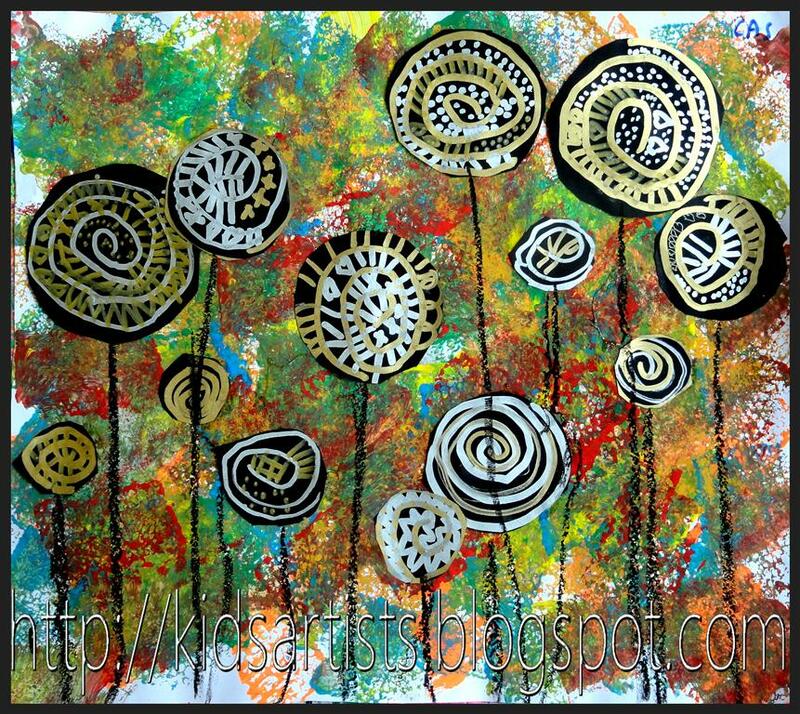 I love your version of a Hundertwasser lollipop tree! The silver and gold on the black are a nice contrast to the colorful sponged background! 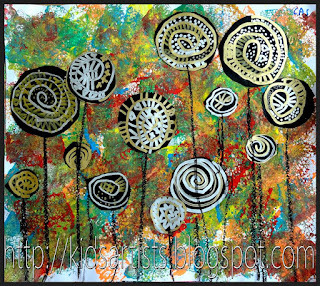 I love the combination of the bright sponged colors with the gold and silver line work on black. I'm going to have to "pin" this if you don't mind. Wonderful! These are such a wonderful interpretation. Terrific! Pinning! Of course it's right with me to pin this lesson! It's one of my best I guess! Beautiful!!!!! Thanks for sharing I am definitely doing this lesson with my students. I love the gold and silver patterned trees! Wow! is right! LOVE this! The gold and silver reminds me a little of Klimt. Love this project. I bet it was a fun one. Good job!! we havent done sponge prints in ages,. I just founda stash of sponge in the store room when we were clearing. Something to work on this weekend. These are SOOOOO cool! I am going to have to try these with my classes. Love them! What a beautiful project! Thanks for sharing :). Love this project. I'm thinking to teach 3 and 4th graders. what kind of sponge did you use? These are beautiful. Thanks for sharing - your details are much appreciated.